Whole wheat chocolate chip cookies are great because the whole wheat flour gives the cookies a lovely, nutty flavor! 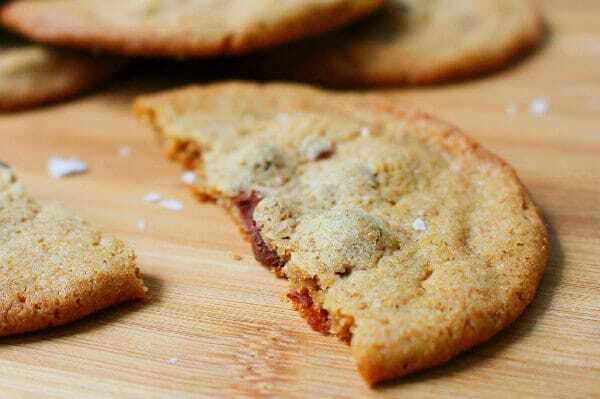 These cookies have yummy crunchy edges. 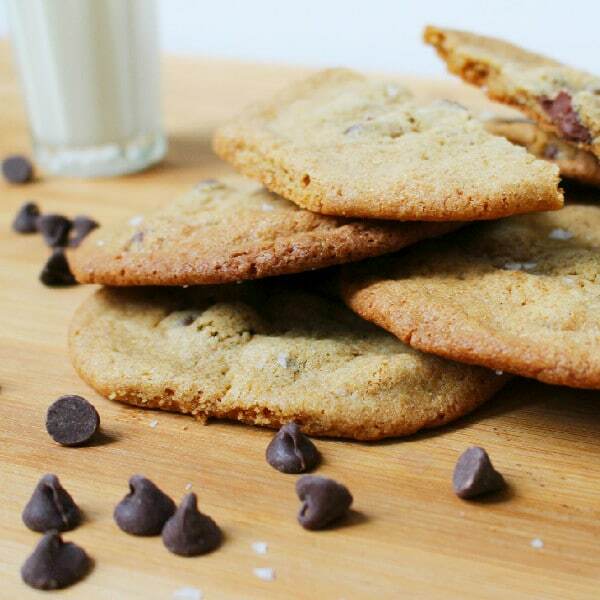 Make a whole wheat chocolate chip cookie that tastes as good as a regular chocolate chip cookie. In fact, make it so good that some people will actually prefer the whole wheat chocolate chip cookie. Yes, it can be done! A while back, I realized that since one of my favorite cookies- these oatmeal chocolate chip pecan cookies– were made with whole wheat, why not try whole wheat chocolate chip cookies? I’m so glad that I tried it. These whole wheat chocolate chip cookies were delicious! Crispy on the edges, chewy in the middle, and that’s just how I like them. So, pour yourself a nice, tall glass of milk. Put it in the fridge to get really, really cold. Then make these cookies and tell me I’m wrong. In a small bowl, combine the flour, baking soda, and salt, and stir together. Set aside. Cream together the butter and sugar until light in color. Beat in the egg, and then stir in the vanilla. Add the flour, baking soda, and salt mixture and stir until just combined. Stir in the chocolate chips. Form the dough into golf ball sized balls. Place equal distance apart on the baking sheets, making sure there is at least two inches between balls. Sprinkle sea salt or flake salt evenly over all the dough balls. Bake for about 15 minutes, or until cookies are golden brown on top. Let cool on the baking sheets for 15 minutes, then remove the cookies to a rack to finish cooling. When completely cool, store airtight. I absolutely love cookies made with whole wheat flour – definitely my favorite way, too! Oh how fun! I had never thought to try this at all! Now I’m curious about cookies and whole wheat flour. Thanks! It’s really worth experimenting. You’ll be surprised by how well it can work, especially in conjunction with brown sugar! Those look delicious and so comforting! I love that you used sea salt! Awesome recipe. Thanks, Florian! Sea salt is a big favorite for me. I’ve really gotten into fancy salts lately. It’s fun! Whole wheat chocolate chip cookies are my #1 favorite! Gotta give this recipe a try, thanks for sharing Katie!! !